DAMDEX is a godsend to the construction industry. It allows you to build quicker because DAMDEX dries concrete faster and tests show up to 35% harder, too. Reinforcing steel is waterproofed so it's protected from rust. Construction can finish sooner so the building is open for business earlier. That also means a quicker return on your investment. 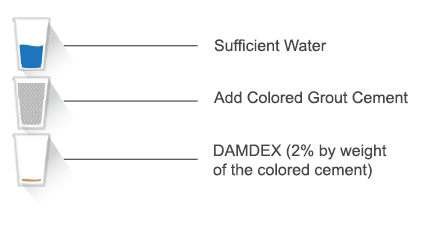 Depending how it is mixed DAMDEX can be used in many ways; to harden and strengthen concrete, plaster and cement; for building walls, laying tiles, grouting etc. 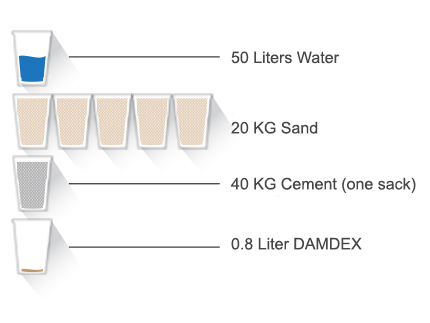 Indeed, DAMDEX gives cement so many more uses and applications. Whether mixing a large or small quantity of cement or concrete the results and effectiveness are the same. The big difference is the amount of money you can save using DAMDEX during construction because you can build quicker, dry faster, finish sooner. Speeds up the hardening process of concrete by up to 50% so you can build twice as fast using project budgets more efficiently. 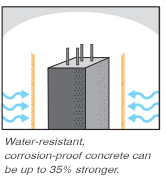 DAMDEX makes the structure waterproof so the reinforcing steel in the concrete will not rust. 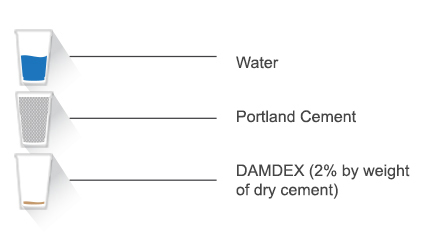 The DAMDEX measure should be 2% of the weight of dry cement powder, according to the desired composition. 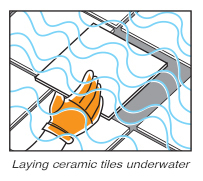 Ceramic tiles can be affixed in water or underwater. The mixture has strong adhesive powers and the layer of cement on the back of tile will not be washed off. Pour measured cement into the container. Pour measured cement into container. 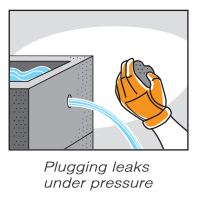 Using the ball of the hand push the cement into the leak. Keep pressing for a few seconds and then release. Put sufficient mix into the hole so it is slightly proud of the surface. Level off the excess cement immediately. Dip a trowel or straight edge in water and drag it over the surface. 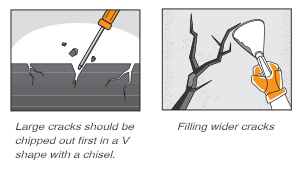 Before mixing cement with a chisel chip away the plaster in a ‘V’ shape along the surface of the crack (see drawing*). Brush out any dust and debris then with a suitable brush apply pure DAMDEX along the crack. Before mixing cement clean the cracked surfaces and brush in pure DAMDEX. Wet the surface then use a wide spatula / trowel to fill upall the cracks. Leave to dry for a few minutes. To waterproof mortar when building walls of brick, pre-cast blocks or lightweight bricks, and waterproofing plaster work. Thoroughly mix the cement, sand and water until the desired consistency is achieved. When building with bricks, pre-cast blocks, or lightweight blocks always remove excess mortar between bricks. To adjust the mix add more water to slow the drying time. Less water speeds up drying time. 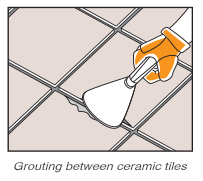 To make fast drying, scratch resistant waterproof grouting. 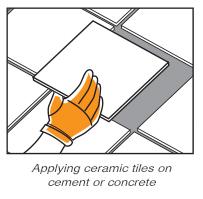 Be sure the area to be grouted is thoroughly clear of all debris and the tiles are perfectly aligned with each other. Next, wet the grouting area with water. 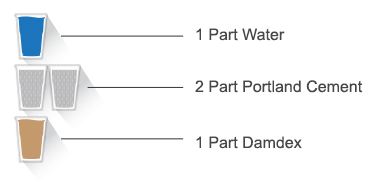 Prove it yourself: grouting results with DAMDEX are far stronger than other grouting products. When absolutely dry rub grouting with a wire brush. Be sure the surface to be tiled is level and even and the tiles are fitted correctly according to the screed. For best results cement and concrete surfaces should be first dampened. Avoid working on hot, dry surfaces. Paint a waterproof coating on tiled, concrete or asbestos roofs, or on floors and wall surfaces or on ceramic tiles. Thoroughly clean the surface to be coated from all dirt, dust, mildew and other foreign matter such as old paint or bitumen from other waterproofing products, anything that may prevent the mixture penetrating deep down. For best results, moisten the surface with water. Never work on hot, dry surfaces. Remove any lumps by riddling/filtering the cement before mixing. In a bucket make an evenly mixed solution of water and cement. When thoroughly mixed pour in DAMDEX and stir well again. Mixture is now ready to use. Clean and moisten surface with water. Use a brush or roller to coat the surface first vertically then when dry horizontally. Apply as a waterproofing layer on a ‘bare’ concrete floor. After coating floor should be "cured" gradually for best results. For optimal results on concrete roofs, and to make them more waterproof, the roof can be coated again with a protective layer of plaster. For best results and to prevent cracking, dry concrete and plaster by curing slowly. Keep continuously moist by covering with sacks for seven days.